This route winds up through a forest of oak and pine trees, before taking you on to the Cortijo del Hornillo, one of the old summer farms in the mountains. 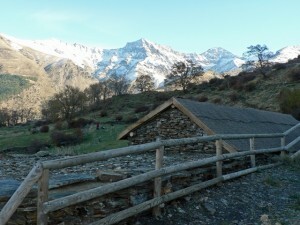 The location is idyllic, and the views of the highest peaks of the Sierra Nevada are incredible. 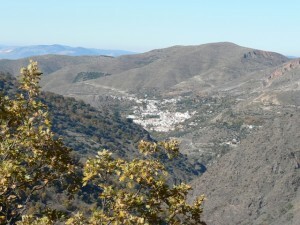 The walk returns along the lower part of the popular Vereda de la Estrella path, in the beautiful valley below. Level This route involves a fair amount of climbing, so it would be hard work on a hot summer’s day, but is otherwise quite manageable if you pace yourself. It sticks to good paths, and is relatively easy to follow. For a more challenging walk, with perhaps even more impressive views, see version B of this route. When to go Spring and autumn are probably best for this walk, to avoid the heat of the summer and potential risk of snow in the winter, although it would also be perfectly manageable in summer if you start out early. Water There is no reliable source of water available on the route. Location: NW Sierra Nevada, Güéjar Sierra The walk starts from the Barranco de San Juan, just upriver from the village of Güéjar Sierra, along the route of the old Sierra Nevada tram. When you enter the village (after 8km), take the right turn signposted Río Genil, Río Maitena. Follow the road round until you get to a set of wooden signs for accommodation and places of interest. 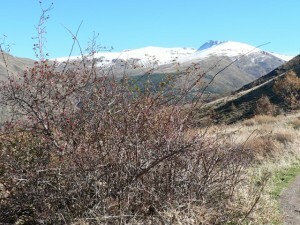 Bear left, marked towards Sierra Nevada, Río Genil. At the next junction, turn right (signed towards Maitena, Charcón, Sierra Nevada) then go straight on (signed Maitena, Barranco San Juan, Sierra Nevada). After reaching the bottom of the valley, turn left through a tunnel (signed Vereda de la Estrella, Barranco San Juan). You will go through two more tunnels and cross the river twice before you reach the end of the road and a car park. By Bus: This walk is not easily accessible by bus. It is possible to walk from Güéjar Sierra to the trailhead, but this would add quite significantly to the length of the walk. This entry was posted in 3-5 hours, All Hikes, Autumn, Güéjar Sierra, Hikes, NW Sierra Nevada, Spring, Suggestions for Autumn, Summer, Top 5 Medium Walks and tagged Sulayr. Bookmark the permalink.